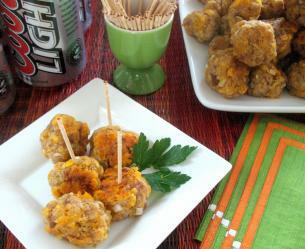 These savory Sausage Balls are great to serve to company! They are a hearty snack or hors d’oeuvre. This is not a light and delicate dish, so you might want to serve them with some fresh-cut vegetables and a healthy dip just to balance out the decadent versus healthy options you provide to your guests! The original recipe for these savory treats has been around (supposedly) since the mid 1960’s. As a consequence, there are hundreds of variations to the recipe, which I’ll discuss at the end of this post. 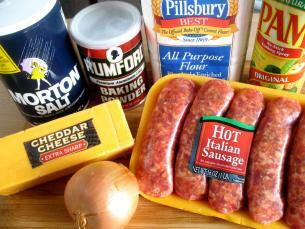 Be sure to bring the sausage to room temperature – it will make mixing these ingredients a lot easier. 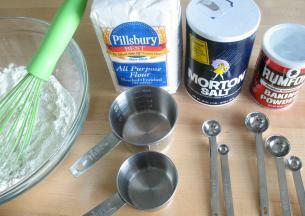 Begin by mixing (with a whisk in a large bowl) the flour, the baking powder and the salt. 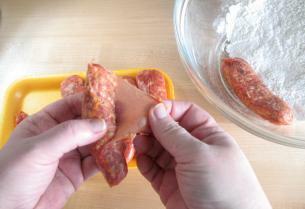 Now, remove the casings (the skin) from around the sausage meat and put the sausage meat into the mixing bowl. It is not necessary to pre-cook the sausage meat. 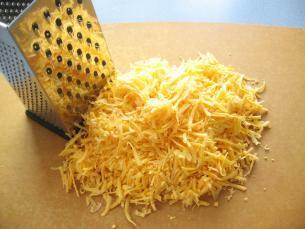 Shred 10 ounces of sharp cheddar cheese. You can use either white or yellow cheddar; just make sure it is “sharp”. Add the shredded cheese and the diced onion to the mixing bowl. With your (clean!) hands mix everything together with both hands. The mixture will feel dry and could take about 4-5 minutes to get everything well mixed. 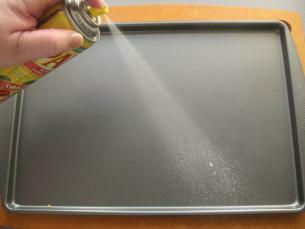 Spray a baking sheet with sides with non-stick cooking spray. You will have to bake them in two batches. 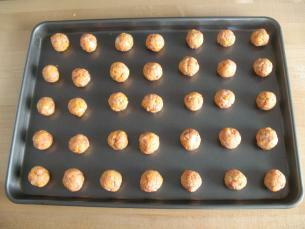 Set the balls on the baking sheet about 1 and 1/2 inches apart from each other. Bake them in a 350-degree preheated oven for 15-18 minutes in total. Set the timer for 8 minutes. 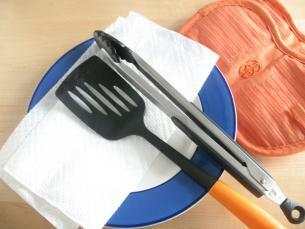 Remove the tray from the oven and with a spatula or a pair of tongs, turn them over. 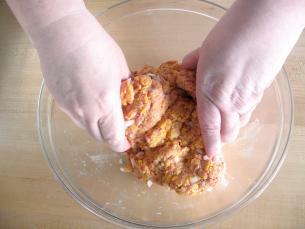 Return the tray to the oven and continue baking the sausage balls for another 7 minutes. Remove the tray from the oven, and if need be, with a spatula, loosen the sausage balls and place them on a plate lined with a paper towel to drain off some of the fat. 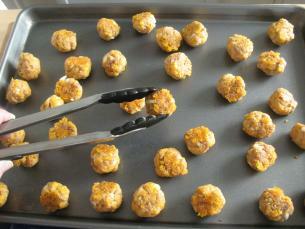 The sausage balls are now ready to be served as finger food, warm from the oven. 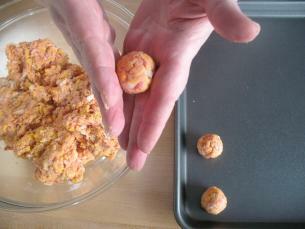 Once these sausage balls have been made, you can freeze them before you bake them. 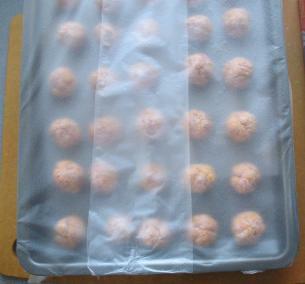 Roll the mixture into balls as described above, and place them on a baking sheet lined with wax paper. …freeze for several hours until they are hard. 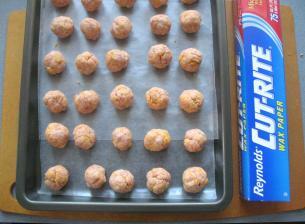 Remove them from the baking sheet and put the sausage balls in a freezer bag. When you are ready to serve them, place them on a baking sheet that has been sprayed with non-stick cooking spray. Let them defrost for 15 minutes and then bake them according to the instructions above. 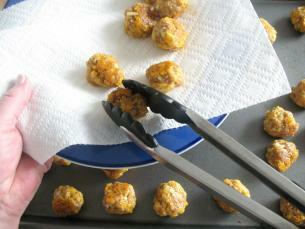 Some sausage-ball recipes recommend adding 1/3 cup of milk or water, or 1 egg. 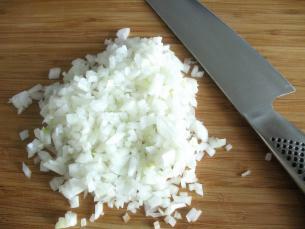 Other recipes call for garlic powder or fresh garlic, chopped green chilies, rosemary, thyme, oregano, or Tabasco sauce. Some suggest that you serve the sausage balls with red pepper jam, or a mustard-mayonnaise sauce, or barbeque sauce. Then there are some recipes that do not ask you to turn the sausage balls over half way through the cooking time. I think that they tend to get a bit over-cooked on the bottom this way. Instead of the flour, baking powder and salt, 1 and 1/2 cups of Bisquick can actually be used for this recipe. Bisquick is a pre-mixed base for making things like biscuits, pancakes, and other baked goods. If you are new to cooking and do not have flour and baking powder in the cupboard, a small box of Bisquick may be the thing to purchase. You can always make pancakes with the leftovers! (Be sure to buy the “Heart Smart” version as it is free of trans fats). 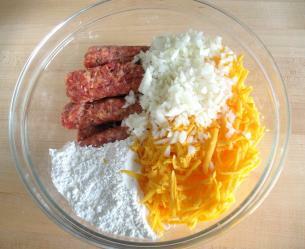 Many recipes call for 3 cups of Bisquick, 1 pound of sausage, and 12 ounces of cheese. That’s it. I tried making these and found them to very dry and hard. 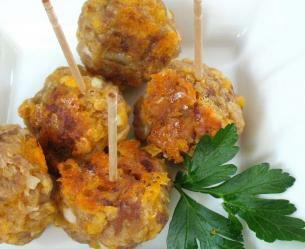 I do hope everyone at your party enjoys startcooking’s version of Savory Sausage Balls! I have such fond memories of visiting my grandmothers in South Carolina. We would always have big breakfasts and for snacks, SAUSAGE BALLS!! I was always fascinated by the tasty little buggers, and in my adult life I have tried to duplicate them a few times to no avail. Thank you so much for sharing this recipe, it is perfect. I have decided that there are some great cooks in South Carolina! My sister has lived in the Carolinas for years. Everyone there loves to entertain and has great recipes to welcome guests. Southern hospitality is alive and well and such a wonderful thing to experience! This looks so delicious. I would like to think of a nice sauce for this.